Universe City becomes a big success. Aled wants to keep his identity a secret, it's very important to him that nobody knows that he's behind the show. Frances works with him using both her art and her voice and when people discover who she is it doesn't take them long to figure out who's behind Universe City. This inevitably means a change in their friendship. Something Frances doesn't know how to deal with. Everything she's ever loved is being taken away from her. Frances needs to face the most awful moment of her past to make things right for the future and to save her best friend. Will she be able to do that? 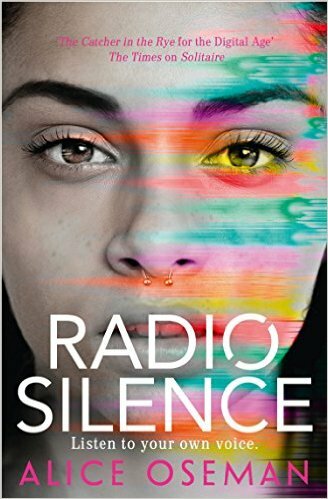 Radio Silence is a beautiful unique story about being yourself and not being afraid to show other people who you are. Frances and Aled have so much personality and I loved their style. They don't realize how great they actually are. When they're making the show they're having such a good time. Unfortunately the good times don't last as their secrets all come out. They're having a profound and unusual meaningful friendship and it's a pity outsiders manage to mess that up. They're really special together, which is the best part of the book for me. The friendship is something that goes really deep and it defines their identities, it makes them the people they're supposed to be. What I like about this story is that there are no labels. The main characters are who they are and I liked that. It isn't easy to show people your true self if you aren't like everyone else and for Frances it's a struggle to acknowledge what's in her heart and to live accordingly. She has it all for a short time and then it's being taken away which is quite sad. Especially the reason behind Aled's behavior broke my heart. 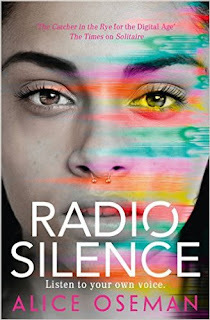 Radio Silence is special, there's no other book that resembles it. It's original, Alice Oseman has great ideas, her characters are fabulous and the story is amazing. I loved this fantastic book and highly recommend it to anyone who's looking for a fresh voice with good ideas and wonderful values. I've been DYING to read Alice Oseman's work! they all seem so amazing.